On a hot summer day, the ice shaving machine runs nonstop. To keep up with the long line of customers, 14-year-old Jonathan Holland packs in the ice while his 15-year-old brother Adam pours on the flavors like vicious vanilla and tiger’s blood. “Since we are brothers and we know so much about each other, a lot of times we can work really in synch,” Adam said. The duo has become popular at the USDA Farmers Market at 12th Street and Independence Avenue near the National Mall. Not just for dishing up tasty treats, but also because AJ’s Hawaiian Iceez is their own company. They’re there every Friday to help pay for their expensive tuition at the Landon School in Bethesda, Md. Once their sister enrolled in another elite private school in the region, their parents had a combined school bill of almost $90,000 per year. The brothers started their business four years ago and every season have continued to make more money than the last. This past year they raked in almost $40,000, and after paying for supplies, they still had more than enough money for one brother’s full-year tuition. The brothers, from Prince George’s County, have become so famous they’re thinking about making this a franchise, with the next location in California. 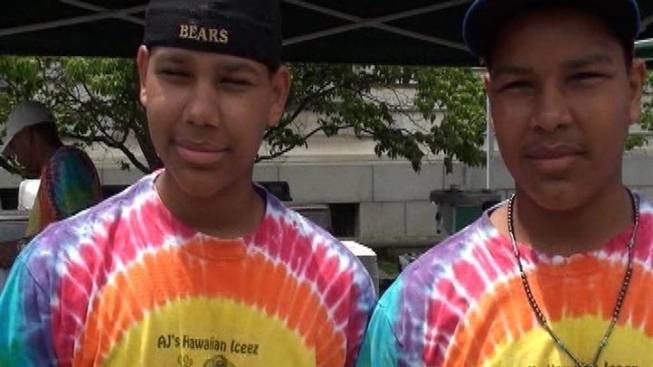 Black Enterprise recently honored the brothers as the top teen entrepreneurs in the nation.